Traveling the 38th Parallel authors David and Janet Carle highlight some important climate change issues on their blog, Parallel Universe 38°N. First, they point to some amazing photos of 30 million tons of silt washing down the Yellow River in China, a key story in their book. 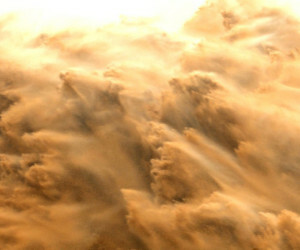 According to the Huffington Post, “To counteract rising water levels that endanger levees, China blasts the river’s mud and sand downstream at an incredible 91,820 cubic feet per second.” See more stunning images on their blog. The Carles also write about the Iberian Lynx, an animal they researched for Traveling the 38th Parallel that is endangered due to climate change. New research shows that the “species may face extinction unless efforts to reestablish them are shifted northward,” the authors write. Read more at Parallel Universe 38°N.